U.S. unemployment is back below 5% for the first time since 2008. However, hiring is slowing down. The U.S. economy added only 151,000 jobs in January. That is way down from December when the economy gained 262,000 jobs. Economists surveyed by CNNMoney projected that the economy would create 197,000 new jobs last month. The job market has been a bright spot in America's recovery from the Great Recession. Unemployment is now 4.9%, the lowest since February 2008, and even wages are finally rising again. It's a long way from when the unemployment rate was 10% in 2009. In a rare press conference, President Obama spoke Friday about the job market's gains from the Great Recession. "The progress we've made going from 10% to under 5%, that's a testament to American workers, American businesses, American people being resilient and sticking to it," Obama said. Related: Are you getting a raise? But there are some warning signs. U.S. economic growth was a mere 0.7% in the fourth quarter. The manufacturing sector is in recession; spending on construction projects is declining; and stocks in the U.S. and around the world are tanking. The broad S&P 500 is down 6.2% this year. Falling oil prices continued to hurt America's energy sector, which lost 7,000 jobs in January. Nearly 150,000 energy jobs have disappeared since September 2014. However, surprisingly the manufacturing sector added a solid 29,000 jobs in January after making little gains last year. The key driver of the American economy is consumers going out and spending. That's why everyone is watching what happens with jobs and wages. 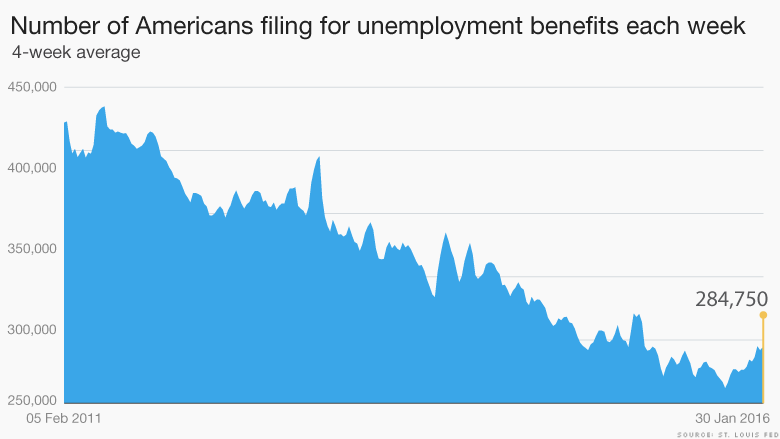 For the past several years, hiring has been strong and fewer and fewer people have filed unemployment benefits. But that's starting to change. The four-week average of people filing for unemployment claims has increased since October, meaning more people are out of work. This trend usually foreshadows slower job growth. "We're going through a period of decelerating employment, not that we're going to go negative," says Phil Orlando, chief economist at Federated Investors. 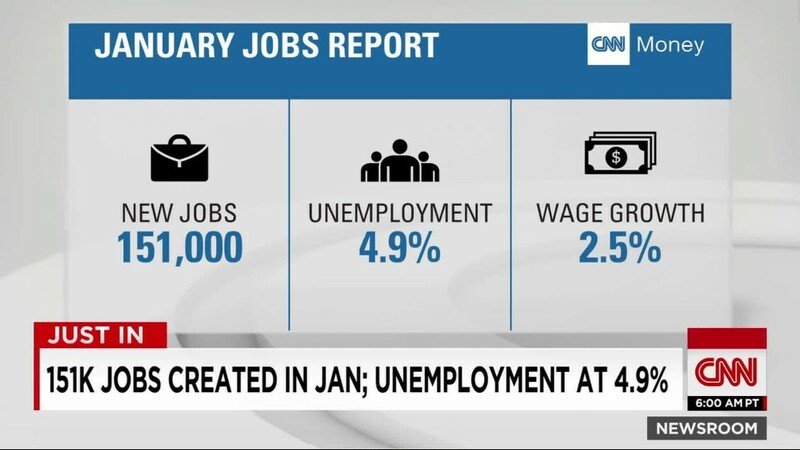 January's jobs report was "a mixed bag." Still, a job gain of 151,000 is decent and unemployment is very low. For many economists, a 5% rate is considered full employment. Some experts worry that if job growth continued at its strong pace in 2015, it could lead to inflation rising faster than expected, forcing interest rates to go up rapidly. Fast-climbing rates can cool down business and consumer spending -- the engine of U.S. economic growth. Wage growth has shown momentum recently. Average hourly earnings increased 2.5% in January compared to a year ago. Wage growth continues to show signs of life after it finally began to pick up momentum last fall. Until recently, wage growth has been the one factor missing from America's recovery from the recession. As the unemployment rate remains low, many economists expect Americans will see paychecks go up. The Labor Department revised up its figure for job gains in November and revised down the December gains, resulting in a net downward revision of 2,000 jobs. The pace of job growth this year may not match up to the strong gains of 2014 and 2015, but other measures like wage growth are picking up momentum. "The closer you get to the summit of the mountain when you're in a recovery, the shorter the steps will be," U.S. Secretary of Labor Tom Perez told CNNMoney. "Job growth may not be what it was a year ago, but it's solid job growth and it's accompanied by solid wage growth."